Zachary did not only produce high quality photos and capture those moments that you will treasure forever, he did it while being part of the event - not that intrusive type that stops the flow of your party and mood of your guests to get his shots. He made us feel very comfortable and put me at-ease that he's got it covered, since as hosts we were juggling alot of other details. After looking at the proofs from the party - which by the way had incredibly difficult lighting (blacklight/GLOW party!) - I saw that he was exactly where he needed to be throughout the event. He is professional, talented and has excellent character -- we enjoyed Zachary very much and feel he was the best value vendor that we hired for our event. Zach did a wonderful job with my son's bar mitzvah photos. We were well guided through family portraits both at the synagogue and at the party. Zach did a great job capturing the fun craziness of our party! Zachary Ruben has been photographing a number of events for our Alumni Association. His work is the first time we have been able to obtain photographs of a quality that we are proud enough of them to use in our newsletters, websites, etc. In addition, the photographs are of such good composure that we are proud to submit them to our University and the Alumni News for their use as they feel appropriate. In terms of the rating dimensions, Zachary provides an extremely high level of service. In my opinion, he is off the top end of the scale on Responsiveness, Professionalism and Flexibility. I would have no hesitancy in using Zachary for our event photography (and videography if needed). I hired Zach to video my daughter’s outdoor wedding and part of the reception. I didn’t think I needed the whole evening’s events documented but am so glad we decided to go with a package that would include the ceremony, introductions, toasts, and dances. From beginning to end, Zach was very enthusiastic to give us the most complete and professional video possible. He captured all of the most precious moments of our big day including highlights of personal messages from grandparents, parents, and friends during the reception. This will be a treasured keepsake for our newlyweds and us, as parents. I would highly recommend Zach to anyone looking for a professional and innovative videographer. His pricing was competitive with many others I’d looked into but his energy and willingness to please was the reason I hired him. We will definitely keep his info in our file should we need a videographer in the future for our other 2 daughters. 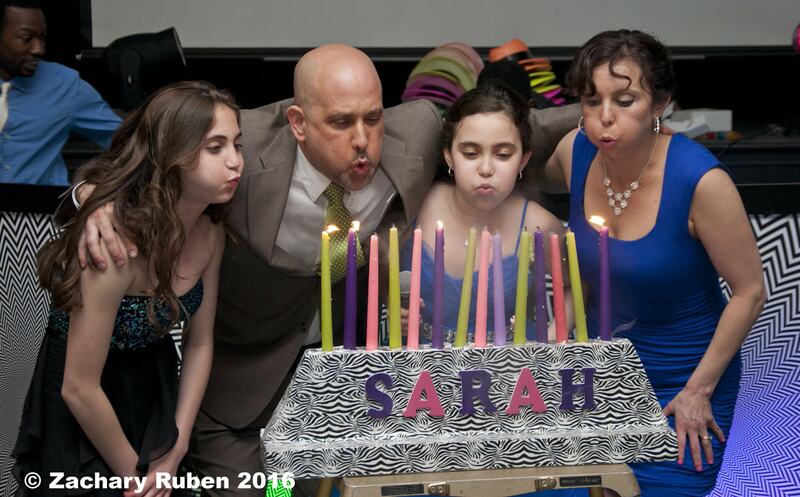 Zach photographed our daughter Sarah's Bat Mitzvah in NOVA. He was professional, reliable and best of all easy to work with. Our guests, MC/DJ team and caterer all loved him, including the 65 kids. Since everyone was so at ease, the photos came out fabulous, especially the candid shots! He really captured the high energy and fun of the party. I've already booked him for our younger daughter's Bat Mitzvah and highly recommend him to anyone wanting a relaxed, fun and creative photographer. -Ilisa and Steve St. P.
Zachary Ruben is a multi-talented individual whose strengths, creativity and problem-solving skills are easily recognized in all areas of his professional experience. He has the ability to be cast into rapidly changing environments, quickly adapt and strategize and then obtain the best possible results. I first worked with Mr. Ruben in 2005, utilising his still photography skills on a multi-location shoot with three difficult subjects. Thanks to Mr. Ruben's patience and knowledgeable eye, we obtained excellent results. Two years later, this time needing a videographer and photographer, I again worked with Mr. Ruben and was especially delighted with his videography. I would strongly recommend Mr. Ruben not only in the areas of photography and videography, but to any individual or company needing a personal, professional and talented young man who possesses a strong work ethic (not often found these days) who works well with people of different ages and backgrounds, and who takes pride in his work. I would hire Zach Ruben without any hesitation, and look forward to future opportunities to do so.